1. The Nature of Forgetting. Thursday to Friday, May 10-11, £10-£15.50, 7.30pm (Saturday matinee 2.30pm), Connaught Theatre, Union Place, Worthing, 01903 206206. Tom has just turned 55. As he dresses for his birthday party, tangled threads of disappearing memories spark him into life, unravelling as a tale of friendship, love and guilt. This ambitious project with actors, mimes and musicians has been created in collaboration with UCL Neuroscience professor Kate Jeffery and inspired by interviews and workshops with organisations such as the Alzheimer’s Society. 2. Big Girls Don’t Cry. Saturday, May 5. Tickets from £27.90, 8pm, Brighton Centre, 0844 8471515. Tenth Anniversary Tour featuring The East Coast Boys. Experience the iconic sounds of Frankie Valli and The Four Seasons authentically recreated by a phenomenal cast and live band. In the 1960s and ’70s the Four Seasons and Frankie Valli were propelled to super stardom by hits like ‘Sherry, December 1963 (Oh What a Night)’, ‘Walk Like a Man’ and ‘Big Girls Don’t Cry’. 3. Kerry Ellis: 20th Anniversary Tour. 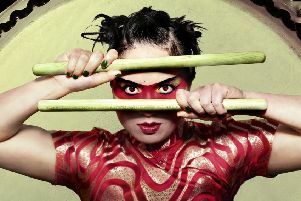 Saturday, May 5, 8pm, £24.50-£26, The Capitol Theatre, Horsham, 01403 750220, www.thecapitolhorsham.com. Kerry is celebrating 20 years since her West End debut. London’s favourite leading lady will sing songs from Bond, to Bareilles to Bacharach and more, telling plenty of stories from her career. Kerry has starred in shows like We Will Rock You and was the first British Elphaba in both the West End and Broadway productions of Wicked. Her many other leading role credits include Nancy in Oliver! and Grizabella in Cats at the London Palladium, Eliza Doolittle in My Fair Lady and Ellen in Miss Saigon. 4. Grumpy Old Women to the Rescue. Saturday, May 5, £23.50-£26.50, 7.30pm, Pavilion Theatre, Marine Parade, Worthing, 01903 206206. Suited and booted in superhero outfits, the Grumpy Old Women are ready to save the day. Comedian Jenny Eclair has joined forces with Olivier Award-nominated performer Dillie Keane and comedy actress Lizzie Roper for their latest tour. Fed up with always having to be in charge, the Grumpy Old Women have put their feet up in retirement, free at last to practise their extreme colouring-in, ukelele orchestra and novelty fudge-making. But with the world in a bigger mess than ever before, is there anything that can tempt them off their backsides to unleash their superpowers and once more come to the rescue? 5. Bugsy Malone summer school auditions. May 6, The Hawth, Crawley, 01293 553636. Young performers (aged seven to 18) have an opportunity to bring Bugsy Malone to the stage this summer at Crawley’s Hawth. Following the success of last year’s Beauty and the Beast, The Hawth presents a tale of gangsters and molls set in the roaring ’20s. Auditions for the 2018 Summer School take place on Sunday, May 6 (9.30am-4.30pm). For full details, including audition times and what pieces to prepare, visit www.hawth.co.uk. Rehearsals for the show are every Sunday from June 10 to July 29 and August 7-8. Performances take place on August 17 and 18. The school costs £250 (£225 THYT, Sway members, musicians), which includes all rehearsals, the production T-shirt and a professionally produced DVD of the show. 6. Tiddler and other Terrific Tales. Monday, May 7, £12.50, 2pm, 4.30pm, The Hawth Theatre, Crawley, 01293 553636. Top circular picture courtesy of Robin Savage Photography. Under the sea, out on the farm and into the jungle, these tales are woven together with live music, puppetry and a whole host of colourful characters from Julia Donaldson and Axel Scheffler’s best-loved titles: Tiddler, Monkey Puzzle, The Smartest Giant in Town and A Squash and a Squeeze. Tickets cost £12. Family of four £46, discounts £2 off. Call 01293 553636. Tuesday, May 8, 8pm (doors 7pm), £11 in advance, £13 on the door, Meridian Hall, East Grinstead, grinstockcomedy.co.uk. Now in its ninth year of providing award winning comedy Grinstock heads to its new home of The Meridian Hall in East Grinstead. These nights see a selection of top comedians from both the TV and the national circuit taking to the stage each month. The May 8 gig features MC Russell Hicks, British-Lebanese comedian Esther Manito and edgy and intelligent stand-up Anthena Kugblenu. The headliner is Henry Paker who won the Leicester Mercury Comedian of the Year in 2008. Since then Henry’s many comic talents have seen him carve out a career as a comic writer, stand-up, actor and cartoonist. 8. The Big Chris Barber Band. Tuesday, May 8, 7.30pm, £23.50, The Capitol, Horsham, 01403 750220, www.thecapitolhorsham.com. The Big Chris Barber Band (bottom picture by Luc Lodder) perform everything from New Orleans blues to late 1920s Ellington, played with extraordinary panache and skill. Audiences will hear songs like ‘Bourbon Street Parade’, ‘Jubilee Stomp’, ‘Petite Fleur’, ‘Ice Cream’, ‘When the Saints Go Marching In’ and many more. Music lovers can count on an exciting evening of high quality jazz and blues, which will appeal to aficionados and newcomers. 9. The Michael Jackson HIStory Show. May 9, 7.30pm, £26, The Capitol, Horsham, 01403 750220. After performances across Australia, New Zealand, Singapore, Hong Kong, Dubai, Indonesia, South Africa, Canada and the US, word of this show has spread among the MJ community. The concert features all of Michael’s hits live on stage, complete with his famous dance moves and a six-piece band. Thursday, May 10, 8pm, £21.50-£24.50, The Capitol, Horsham, 01403 750220, www.thecapitolhorsham.com. Forbidden Nights aims to give audiences an evening to remember with thrills, fantasy and forbidden thoughts at every turn. This group of world-renowned circus artists will perform heart-racing tricks in a fusion of daring routines, acrobatics and provocative choreography, with a few men in uniform thrown in for good measure.